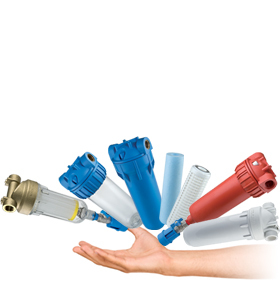 Cold water filters: filter housings for filtration and water treatment that are suitable for various configurations of cartridges, available in many heights and variations. The PLUS 2P SX 2 piece water filters are suitable for housing standard SX (DOE) cartridges. The PLUS 3P BX 3 piece water filters are specifically designed to house BX cartridges with quick coupling and double 45 mm o-ring (SOE - o-ring 222). The MIGNON PLUS water filters are housings suitable for exclusive 5” size M SX (DOE) cartridges with external diameter of 50 mm, 5” height. Water filters DP DS are equipped with 360° offset rotating connection unit, capable of easily connecting to horizontal and vertical piping. Water filters DP BIG are housings specifically designed for cartridges SX (DOE) with external diameter of 4.5”. Water filters DP BIG F, available in the variants MONO, DUO and TRIO (with one or more filtration layers) are equipped with metal frame. The Hydropul cleaning filters are a powerful solution for filtration of cold water at the inlet.